Redbird the Silly Song Singing Bird! Peter’s comically acrobatic and musically skilled ground and stilt characters are outrageous fun! Equally at home with a mini-guitar and song or a soccer ball on stilts, Peter's quick wit and agile, often musical characters have audiences of all ages spell-bound from the very second he bounds into the performance space. His interactive musical stage show, Let's Make a Song! is high-energy fun for all-ages. Peter G-G is a circus artist, musician, host and professional actor of over 30 years. He performs across Canada with professional theatre and circus companies, at festivals and events large and small, near and far, and as well as in lead roles for stage, film and TV. I have worked with Pete on many events over the years because I know I am getting a talented professional who understands how to create an experience for my guests. His characters and costumes are always wonderful, and you can relax knowing that he is going to bring his everything to the event. For me, it is always an easy decision, if I need entertainment at my event, I find a way to work with Pete!!! *I want to add that his whole family is talented if you are needing multiple performers!! The most amazing talent and heart warmimg experience . Pete is exceptional to work with as he lends a hand to whatever task that he can assist in. His energy fills the room and beyond as his enthusiasm is infectious .....for the crowds join him in festive songs. His range and ability to sing and make up new ones on the spot while balancing on stilts is only second to the size of his caring heart . This man is no Prima-donna as he expends his energy forward and gives his ALL then digs deep to give you more. You will never be disappointed with Pete's unique style of entertaining. Thank you so much Veronica, for your kind words and for having me back again. Such a joy to perform at - and be a part of - your truly beautiful event! 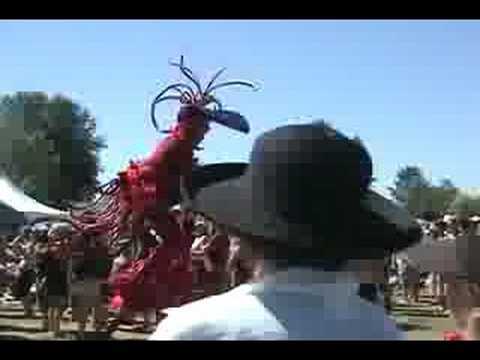 Comically musical and athletic, interactive stilt characters? You bet! Elegant and whimsical stilt and ground characters? Of course!! Highly trained, improvisational and musical actors creating a character just for your event? Absolutely!!! Ruffle Redbird is back with his interactive musical improv show, Let’s Make a Song! Redbird - playing his groovy guitalele - gets the crowd rolling with awesome and silly examples of how hit songs are made, from 70's rockers to the Top 40 of today. Then, he takes ideas and suggestions from the crowd and, line by line, writing them on a big whiteboard, together they create a cool new tune. Finally, Redbird invites daring members of the audience to join him on stage to sing and perform it: instruments are handed out on stage and passed through the audience, and it's time to ROCK! The interactive format allows for everyone's ideas, and quickly results in a wild and wonderful finale where all the participants and audience have created a new hit song! Ruffle Redbird is professional actor/singer/musician/circus artist Peter G-G. Peter has played at major festivals and events across Canada and beyond for thirty plus years, and is a proud member of CAEA, SOCAN, ACTRA, UBCP and Clowns Canada. Peter G-G is a circus artist, musician, host and professional actor. He performs across Canada with pro theatre and circus companies, as well as in lead roles for stage, film and TV. Peter has played at major festivals and events across Canada and beyond for thirty plus years, and is a member of CAEA, SOCAN, ACTRA, UBCP and Clowns Canada. "I was blown away…he is an amazing performer with what it takes to add real value to a festival." Peter’s comically acrobatic and musical ground and stilt character performances include: Cirque du Soleil’s Kooza; 2015 Pan Am Games; Grey Cup 100 Toronto; Olympics 2014, 2010 & 2006; NFL, MLS and NHL games, including co-host of NHL All-Star Week in BC; Sarah McLachlan’s Voices In The Park; Toronto Int’l Circus Festival; Vancouver’s SummerLive, Celebrate Stanley Park 125, Van Dusen 40th and QE Park’s 75th Anniversary Festivals; Winnipeg and (annually) Vancouver Folk Fests; Vancouver, Surrey, Coquitlam, Burnaby & Mississauga Canada Day; annual Whistler events including: Children’s Festival, Street Ent & Family Apres weekends, Gran Fondo, North Face ½ Marathon and Cdn. Nat’l BBQ Champs; Walk for Miracles; Pan Am Games 2015; a cross-Canada series of events for President’s Choice; along with countless festivals, corporate and family events, hospice and hospital visits, films, TV shows, commercials and more. Peter also performed 4 seasons of soccer on stilts for the Vancouver Whitecaps at BC Place - MLS games and special events - and has taught stilting, juggling and physical theatre skills in ON & BC. Trained as an actor at the George Brown College Theatre School in Toronto (and in Phys Ed at Queen’s U before that, where he won the Rookie of the Year award for athletics in his first year), he has performed in professional plays and musicals across the country since 1987, in everything from Miss Saigon (as The Engineer) to Johnny in Frankie and Johnny in the Clair de Lune. 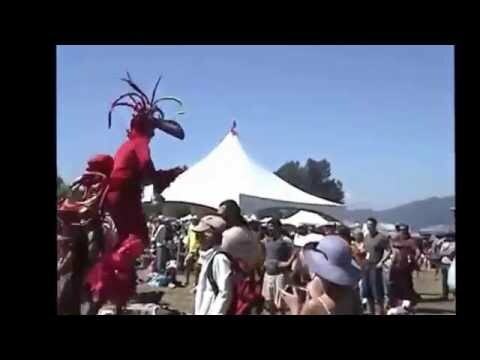 These days he also joyfully performs at many festivals and special events as a stilt walker and physical character, most notably as the silly-song-singing, guitalele-playing Ruffle Redbird. Also a musician and singer/songwriter, Peter plays a number of solo corporate and bar gigs and fundraisers each year, sings and plays guitar in the cover band The Lollygaggers, and has recorded two original CDs. As a writer he has written two plays - including an eco play for youth with the help of Dr. David Suzuki – a feature screenplay, a doc script on the SE Asian tsunami (for which he traveled to Thailand) and a small book on generosity. And his considerable list of lead and supporting roles in film and TV continues to grow. Peter has also worked as a caregiver with physically and mentally challenged adults and children, as a childcare worker with Family Services of Vancouver, and as a physical theatre and circus skills teacher. His volunteer work includes projects with Oxfam and Amnesty International, among others. He celebrated 20 years as a Big Brother with his little bro Brian in May, 2011. Peter was born in Conway Ontario, pop. 55, on his family’s dairy farm, and is the youngest of nine children. The father of two wild and wonderful kids, Peter is always looking at what work is most closely in line with his heart's truest desires, and moving in that direction. “Peter Graham-Gaudreau's energy is magnetic. He worked the room of 300 people and had everyone smiling and clapping the entire performance. He is a brilliant performer. The definitive "One Man Show"! " Jodi Harper, Events Producer / Toronto, Ont. "Peter G-G is an entertaining and thoroughly engaging performer, having performed for our events as hilarious, family-orientated, stiltwalking characters. Pete was such a refreshing joy to work with. On an incredibly tight and challenging production he overwhelmed us with his infectious enthusiasm, perseverance, responsiveness, and adaptability. He is a go-to creative project manager especially wired for leading in a collaborative environment. His knowledge and skill with large scale, group puppetry was especially impressive. "My husband and I heard Pete play at the Cypress Ski Lodge, and after a great night of dancing, singing, and laughing, we agreed that we had to have him play at our wedding! (We weren't even engaged yet!!) Pete had such a warm energy and his love for music and entertaining was so infectious, we knew that our friends and family would love him as much as we did - and we were right. Pete went over and above to ensure that the music on our wedding day was everything we hoped for, even helping me to compose a song. We are so grateful that Pete was a part of our special day." "Peter Graham-Gaudreau is a magician. I know, because I saw him at work. He took our rambunctious class of Grade 3's and 4's and turned them into terrific singer/songwriters. It was a wondrous collaboration and to the kids it was all fun. I know it made them feel so good to go from an idea to a finished, polished song they could sing in front of the whole school to wild applause. It was an experience they, and I, will never forget. It's a very unusual talent Pete has." For stilts, nothing required except a changeroom, table and chair. Pretty much every popular Christmas and Holiday song ever written! -	Do You Want to Build A Snowman? Roy Forbes – Do I Love You? -	Did She Mention My Name?